Published by Thompson Reuters in 2013, Understanding Changes to Colorado’s DUI Laws is the essential resource for anyone who has been accused of DUI, DWAI or DUI-D in the state of Colorado. Changes in DUI law must be understood if you want to get the best possible results from your case. Here in this new edition you will find important changes like marijuana THC inferences and the revised rules pertaining to driver’s license revocations and reinstatement procedures. Nationally renowned DUI defense attorney Jay Tiftickjian has written a comprehensive guide designed to help you be informed and educated when you are facing a DUI charge. Here in this book he breaks down all parts of the criminal court and DMV process while addressing every aspect of a Colorado DUI case. Covering the entire process, from when you first make contact with law enforcement through your trial and sentencing, he takes you through all the steps that you will possibly go through. Easy to understand and constructed to help even the most inexperienced, the guide can help you prepare for both your court case and your DMV hearing. In addition to the step-by-step guide through the DUI process, attorney Jay Tiftickjian also includes information that can prove extremely helpful as you face the road ahead – information you may not have thought of, but that you need to know. He helps you understand what you need to look for in a DUI attorney, and what you can expect as you work with your attorney to resolve your case. With this guide, you can move forward with confidence, sure in your knowledge of what you can expect and how to best deal with even the most challenging situations. The state of Colorado takes driving under the influence very seriously- whether it’s for drugs (DUI-D), DWAI, Underage DUI (UDD), or alcohol, which means you can expect the prosecution to be extremely persistent in its pursuit of conviction and punishment. Regardless of your situation, or how fair or unfair the laws actually are, when you are accused of a DUI you are at risk of losing money, your driving privileges and possibly your freedom. There are no guarantees in a criminal defense case, but there are ways to increase your chances of a positive outcome. Educating yourself and working with a skilled attorney are the two most important things you can do for your case. Studying the book Understanding Changes to Colorado’s DUI Laws and hiring a good lawyer are two major steps you can take for you benefit as you move forward. When you are facing DUI charges, there is no substitute for a good attorney. Understanding Changes to Colorado’s DUI Laws is designed to be a companion and reference as you work with your chosen DUI attorney on your defense. The more informed you are about the process and the law, the more comfortable and confident you will be as you go through what can be a difficult process. With the help of your attorney and the information you will learn in the guide, you can seek the outcome you need from your case. If you are in Colorado, attorney Jay Tiftickjian and his legal team would be happy to discuss your DUI case with you in a free initial consultation. Please contact Tiftickjian Law Firm, P.C., for all of your Colorado DUI defense needs. Our team looks forward to assisting you in any way we can. 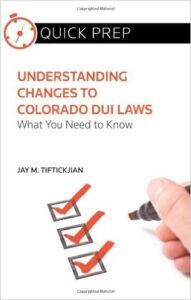 Understanding Changes to Colorado’s DUI Laws is available from Amazon.